The first time I’ve known Bretagne was from L’île aux trente cercueils (The Island of 30 Coffins), one of the Arsene Lupin series, written by Maurice Leblanc. The heroine in the story, Véronique d’Hergemont, was lured to Bretagne peninsula to begin her bizzare adventure in a small island near Bretagne. Although I considered the island at which Veronique d’Hergemont arrived was fictional, I managed to find the cities she had been to in Bretagne–Concarneau and Quimper. Asides from the story I’ve read, I’ve also heard that Bretagne was a vacationing place for French people due to its beautiful landscape and pleasant weather, though not as popular and well-known for foreign tourists. Probably due to the geographic benefits, Celtics were the first to immigrate to Bretagne during 600 BC. Later came the Irish and Welsh. Despite that Roman empire governed Bretagne from 79 BC to 5th century, Bretagne was an independent country until 15th century. When Duke of Bretagne, Francois II, died in a battle, his only daughter, Anne de Bretagne, married king of France, Charles VIII. Bretagne prolonged its independence but not for long when Charles VIII died in 1498 and Anne again married Louis XII, the newly enthroned French king. Bretagne submitted to France in 1532 when Anne de Bretagne died. Mixing various cultures especially those from Britain, Bretagne has its own unique traditions, food, and language. Bretagne still uses "Breton" language. Bretagne is French for "Brittany" which also means "Minor Britain." Rennes has been the gate between France and Bretagne peninsula and also the biggest city in Bretagne. It became the capital of Bretagne region when Bretagne was converted into part of France in 16th century. Medieval houses can still be found in town center. Carnac is a small town on the south coast of Bretagne with population under 5,000. 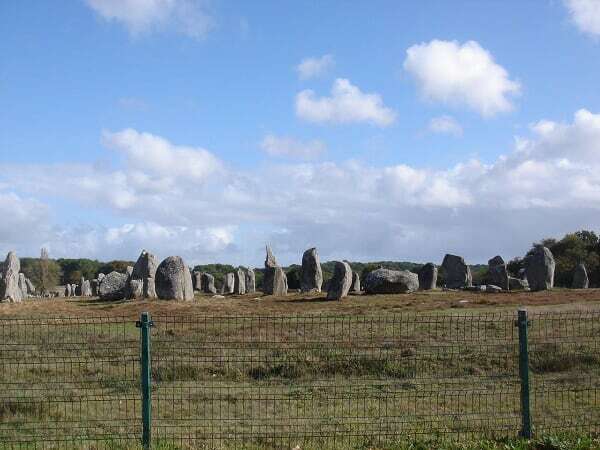 Carnac is renowned for having the largest prehistoric standing stone sites. The number of standing stones is over 3,000 and covers up to 40 acres; some stones are as tall as 12 meters. These stones clustered in three groups–Ménec, Kermario, and Kerlescan. It was speculated that the stones were erected by pre-Celtic people during the Neolithic period that lasts from 5,000 BC to 2,000 BC. The stones were aligned in perfect straight lines so Brittany Arthurian legend had the stones were Roman legion on which Merlin casted spell. One of the standing stone sites: Alignments du Menec. Quimper is a city about 180 km west of Rennes and was built on the confluence of 3 rivers–Steir, Odet, and Jet; it has been called "Soul of Bretagne" because of its distinctive Breton character adopted from Celtic heritages and being the most traditional city in Bretagne. An old theater. I was not sure if it’s still in use. These classical-looking houses are offices. I especially loved the series of footbridges spanning the rivers that flows through the city. Most of these bridges were even decorated by plants and flowers that added rustic and nonchalant atmosphere to this city. I even "zig-zagged" through some of these bridges while walking along the riverbank toward the old city center. Outside the medieval fortifications of the old town; part of Cathedrale St-Corentin can be seen from here. It was built between 13th and 16th centuries. The two towers seen in the photo are both 250 feet tall. Cathedrale St-Coretin is a Roman Catholic cathedral. Different from gothic style cathedrals, Cahtedrale St-Coretin de Quimper bends slightly in the middle to avoid a swampy area when it was constructed. Inside the fortifications is the old town center, in which most shops and houses still reside. Pottery is also a distinguishing character in Quimper. The products are often illustrated with men and women in traditional Breton costumes and such pottery goods are called "Quimper faience pottery." Various shops in the old city center. I arrived at Quimper in a Sunday afternoon, thus all the shops were closed and I walked through the bridges to the old city center. There were not many people but some were just like me–strolling in the old city center and enjoying the peacefulness of this town. Restaurants were only ready by 7 pm at earliest, so people found small coffee shops scattered in town to relax, read, or chat. It was nice to discover this kitchenware-gift store that displayed such cute stuff in the window. The sunset was just at the right time to give me a chance to catch the beautiful silhouette of the bridges, river, trees, and houses for this wonderful photo. The coast from Plestin-les-Greves to Louannec is a 30 km-coastline in northern Bretagne is known as "Cote de Granit Rose," meaning Pink Granite Coast due to its pink granite rocks along the coastline. 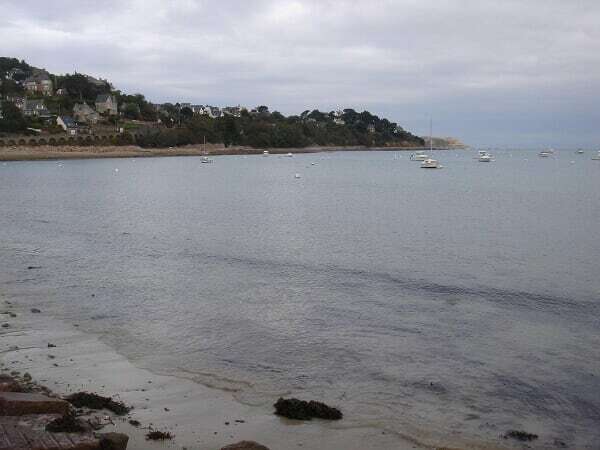 Perros-Guirec is a seaside resort encompassed in Cote de Granit Rose. Despite the unusually shaped pink rocks on the beach, Perros-Guirec is a popular place for swimming, sunbathing, and water activities. There were not many people around while I was there; I guess because it’s autumn and the weather was gradually turning cold. The town was very peaceful, and it was serene to walk on the hills and listen to the tide on the beach since there was little crowd while I visited. The harbor. My camera could not catch the crystal-blue of the sea. There I could see various fishes twirling between the boats. Some houses are built on the hills. The pinkish stones are the "rosy granites" giving this place a distinguishing touch. A closer look of the stone. The stones even beams with pinkish light under the sun, but too bad there was not much sunshine on the day I visited. I stood on the beach and saw several white shells got washed up by the tide. There’s one caught in seaweeds. Residential area with adorable houses on the hills overlooking the sea. "Who are you?" the orange cat seemed to ask. 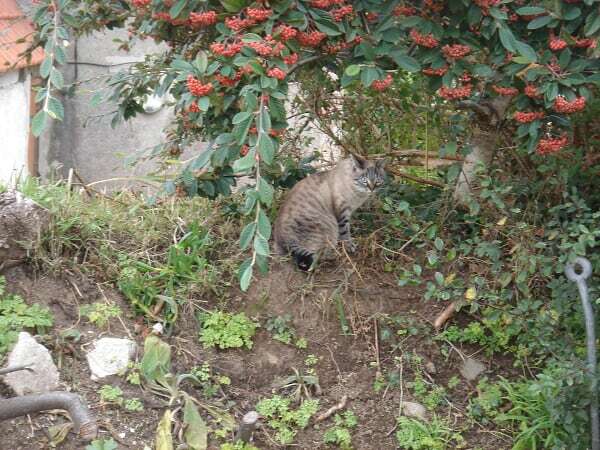 He was relaxing in front of a house and reluctant to move even when the mistress was driving through. Finally he got a bit interested in me and walked to snuggle against my leg. The mistress greeted me with a warm smile. 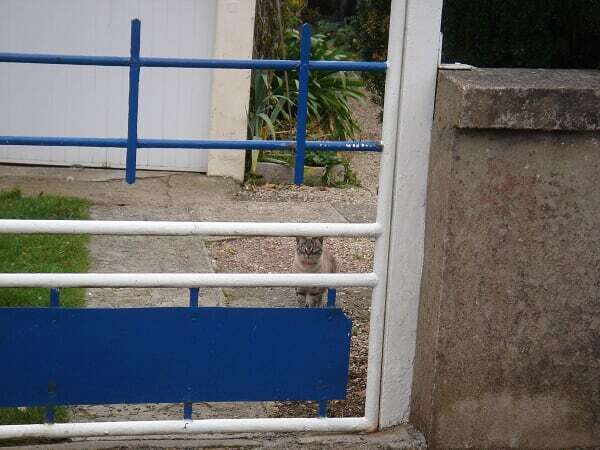 People in Bretagne are friendly, I guess so are their pets. 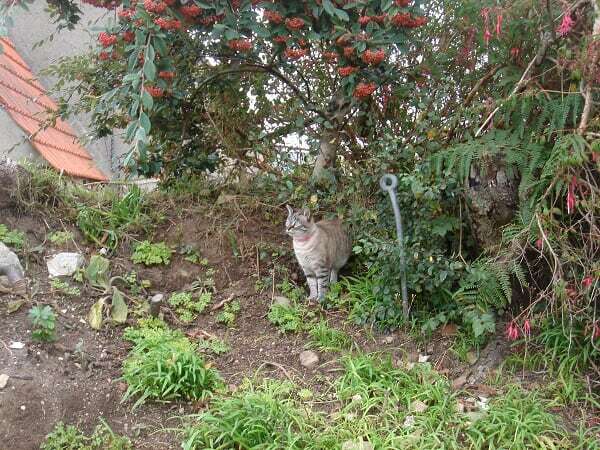 Another cat in the residential area. Her sky-blue eyes shined with curiosity. 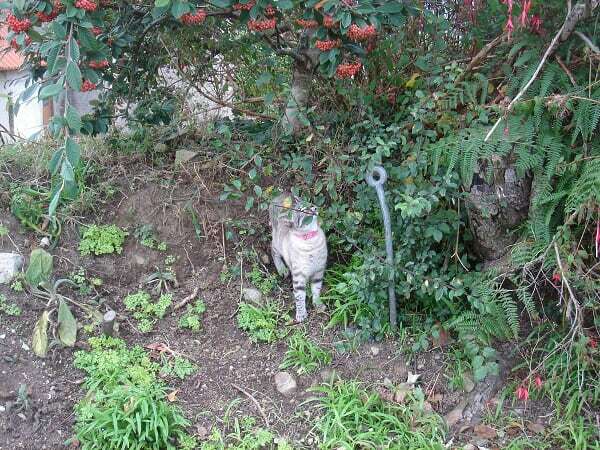 This big yellow cat only glimpsed at me for a second and went back to meditation. Anne de Bretagne, married 2 kings of France… some scandal.. hehehe~~ This region has that small town feel, a mixture of british, benelux feel. Anne de Bretagne is a tragic princess; she never had a chance to go back to Bretagne ever since she married king of France. It\’s said that she\’s the saddest person in Bretagne.